EXTRA: New Location for T-2018! We had to let some days pass and capture the sign of the times. I had to travel south, to work this out with Giuseppe Morgana and Trasformatorios friends in Sicily. 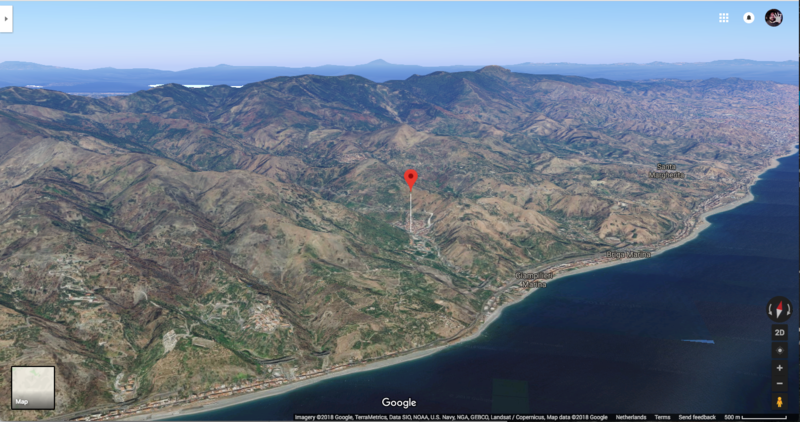 Giampilieri shares with last year location, Scaletta Zanclea, many naturalistic details and the territory, as well as the outcomes of the terrible landslide of 2009. Is not a second choice location at all. The great support I received from the local community made me take the decision to move there immediately. It was sufficient to arrive in Piazza Pozzo, and see the strange white concrete scar; the ground works to secure the village, with the traces of the houses. To see the welcoming party from the association “Giampilieri 2.0” that offered help and did a great job in reconstructing the damaged community, to talk with Don Alessandro, the 30 something dynamic priest of the local church and to have a short walk in the landscape. Giampilieri has all the strength and the weakness of many of the locations we have been operating so far and, if possible, these contradictions are pushed to the maximum. Yet it seems a community busy with re-generation and not at all a desolate, remote place. The land is cut through by a river, dry in the hot months of the summer and now rumbling with water. The place used to be a place for mills, treating the grain to make flour. Higher than the village two fractions, Molino and Altolia, even smaller and more remote. From here departs many old roads, stepping up to reach the high of the mountains above and reach the interiors of the islands. Remaining of towers, churches and old monastery are within the reach of a short uphill walk. Including Scaletta Superiore and her mysterious towers that we see at last, in the dusk, for a last glimpse and a picture on the mobile. Giamplieri, explains Padre Alessandro, is too far away from the center of Messina not to be a de-facto independent community but has no major, no local police station or Carabinieri. All the community regards to the church and to the local civic associations as “Giampilieri 2.0” for reference. Yet as any small village in Sicily the community has her history, identity, and traditions. As an example the holy feast of the “Annunziata”, where the community gathers (even traveling from abroad on purpose) to feast the local Madonna and carry her statue to the sanctuary uphill. The suggestions for the next trasformatorio as you see are many. And we will try to do the whole of the program, even if the main focus is on the Lab, where our temporary community of transformators has to be able to work in peace and use the materials found in many ways hiding in the territory. And so we spoke with the culture group of the City of Messina. The usual one-man band here has been given as a task to 5 people. The first we have encountered, Alessandra Mammoliti, we met in the studio of the radio. She is the first person we meet and her suggestion for Giampilieri reassuring and leading to Donatella, from Giampilieri 2.0 and Pierpaolo Zampieri. In the next days, we managed to meet most of the group, that have really acted fast with wise and prompt advice. I have to thank them all. The Assessor himself, Federico Alagna called in to reassure us. The city of Messina will happily allow our activities for 2018. And this is how we passed from a 2000 something village to a city of 238,000. I must spend some words as well on this unexpected change of plan. The reasons why the administration of Scaletta Zanclea has decided not to renew the agreement with us are still a mystery. The agreement was on their table, together with the whole plan since 29 of August 2017 and the positive experience of the previous year. Actually, in the previous edition, everyone invested time and efforts to help us, up to village officials paying out of their own pockets to allow us to be there in the terms agreed. The administration was constantly upgraded on the status of our preparations, invited to join to meetings and had given us no reason to worry about a change of plan. You can imagine the stupor when the decision not to grant us anymore their favor has been communicated via a WhatsApp one-liner! This is probably the only concession to modernity from an inaccessible Major, that still does not returns my phone calls. That is a mystery that I am sure will solve by itself one day. We even agreed to pay out of our own small budget the places to accommodate the artists, just to be denied any access afterward. Following a formal request, formulated as agreed between the various frantic negotiators. Maybe the proximity of the elections (both the political one and the local in may) got us, unwillingly, into a local power struggle. Lesson learned: one should never underestimate the power of influence of local political struggles no matter how small is the community. They tend to reproduce, as in a fractal, the shape and tactics of the bigger ones. And in Italy this is a field for brave at harts to play in. What we know for sure that the people of Scaletta Superiore were looking forward to having us with them. Working the second year in the area was something a lot of people was looking forward to. And so it will be, in a way, because we won’t let them down moving to the twin city of Giampilieri that is merely a 30′ walk from Scaletta. And we will keep negotiating a visit to the area to please our old friends in the somehow neglected “Scaletta Superiore” area, to view the installations and traces of last year work and to appease any doubt will be around about our commitment to work together with our friends. See you in Sicily in 6 weeks time! Abbiamo dovuto lasciar passare alcuni giorni per catturare il segno dei tempi. E ho dovuto viaggiare verso sud, per risolvere questo problema con gli amici Giuseppe Morgana, RE e Mose’ e tutti gli altri amici “trasformatori” di Sicilia. Giampilieri condivide con la location dell’anno scorso la posizione e molti dei dettagli naturalistici e paesaggistici, nonché l’aver sofferto la terribile alluvione del 2009. Non è affatto per noi un luogo di seconda scelta. Il grande sostegno che ho ricevuto dalla comunità locale mi ha fatto prendere la decisione di trasferirci qui immediatamente. E’ bastato arrivare in piazza Pozzo e vedere la strana cicatrice bianca del cemento; come il terreno e’ stato lavorato per proteggere il villaggio, le tracce delle case. Vedere la festa di benvenuto dell’associazione “Giampilieri 2.0”, che ha offerto aiuto e fatto a detta di tutti un ottimo lavoro nella ricostruzione della comunità danneggiata; Parlare con Don Alessandro, il trentenne e dinamico sacerdote della chiesa locale, fare una breve passeggiata nel paesaggio. Nessun dubbio. Giampilieri ha tutte le forze e le debolezze di molti dei luoghi in cui abbiamo operato finora e, se possibile, queste contraddizioni sono spinte al massimo. E nonostente cio’ sembra una comunità piu’ alle prese con la rigenerazione che con il lutto e non e’ affatto un luogo remoto e desolato. La terra è attraversata da un fiume, asciutto nei mesi caldi dell’estate che ora canta pieno d’acqua. Il villaggio era nato come valle piena di mulini, che trattavano il grano per fare la farina per tutti. Più in alto del villaggio, salendo la strada stretta verso i monti, due frazioni della frazione, Molino e Altolia, ancora più piccole e remote. Da questa valle partono molte vecchie strade, che si intravedono salire per raggiungere l’alta montagna sovrastante e raggiungere gli interni dell’isola. Resti di torri, chiese e di un antichissimo monastero sono tutti alla portata di una breve passeggiata in salita. Compresa Scaletta Superiore e le sue torri misteriose che vediamo finalmente, nel crepuscolo, dalla collina di fronte, inaccessibile, tante volte ammirata l’anno scorso, per un’ultima occhiata attenta e una foto sul cellulare. Giamplieri, ci spiega padre Alessandro, è troppo lontano dal centro di Messina per non essere di fatto una comunità indipendente: non ha né stazioni di polizia locali né carabinieri. Tutta la comunità considera la chiesa e le associazioni civiche locali come ad esempio “Giampilieri 2.0” come il suo riferimento. Tuttavia, come ogni piccolo villaggio in Sicilia, anche questa comunità ha la sua storia, identità e tradizioni. Ad esempio la festa sacra della Madonna delle Grazie, dove il paesello di mille anime si riunisce (anche viaggiando dall’estero apposta per non mancare l’occasione) per festeggiare la Madonna locale e portare con coraggio in salita e discesa la sua pesantissima statua al santuario. I suggerimenti per il prossimo trasformatorio come vedete sono molti. E proveremo a fare tutto il programma previsto, con gli opportuni cambiamenti. Anche se l’obiettivo principale è sul Lab, dove la nostra comunità temporanea di trasformatori deve poter essere in grado di lavorare in pace per utilizzare i materiali e le suggestioni che si trovano in molti modi nascosti nel territorio e nelle sue genti. E così abbiamo parlato con il gruppo dell’assessorato condiviso per la cultura della Città di Messina. Quella che in genere e’ una one-man-band, qui nella citta’ Messina della democrazia dal basso è gestita da 5 persone. La prima che abbiamo incontrato, e’ stata Alessandra Mammoliti, con cui eravamo in contatto. Ci siamo incontrati nello studio della radio. È suo suggerimento per Giampilieri che ci porta a Donatella, dell’associazione Giampilieri 2.0 e a Pierpaolo Zampieri altro attivissimo professore universitario e assessore. Nei giorni successivi grazie a loro e a tanti altri siamo riusciti a incontrare la maggior parte del gruppo consiliare, che ha agito davvero in fretta con consigli saggi e tempestivi. Devo ringraziare tutti loro. Lo stesso assessore, Federico Alagna mi ha chiamato per rassicurarci. La città di Messina consentirà felicemente le nostre attività per il 2018. Ed è così che siamo passati dal lavorare in un villaggio di 2000 abitanti ad un villaggio di 1000 che e’ aprte integrante di una città di 238.000 abitanti. Devo spendere anche alcune parole anche su questo inatteso cambiamento di programma. I motivi per cui l’amministrazione di Scaletta Zanclea ha deciso di non rinnovare l’accordo con noi sono ancora un mistero. L’accordo era sul loro tavolo, insieme all’intero piano di lavoro per il 2018 dal 29 agosto 2017. Assieme all’esperienza positiva dell’anno precedente. Per essere giusti per la precedente edizione, tutti coloro che avevamo incontrato nell’amministrazione avevano investito tempo e sforzi per aiutarci, fino ad assitere al fatto che i vari assessori del villaggio avevano pagato di tasca loro per permetterci di essere lì nei termini concordati, non essendo ancora disponibili le foresterie. E’ anche da dire che l’amministrazione è stata costantemente aggiornata sullo stato dei preparativi, è stata invitata a partecipare alle riunioni, anche a quelle in calce all’ottenimento dei fondi europei per il progetto 2018, e non ci aveva dato motivo di preoccuparci per un cambiamento di programma. Potete immaginare lo stupore quando la decisione di non concederci più i permessi necessari e l’accesso alle strutture ci è stata comunicata tramite una linea su WhatsApp! Questa è probabilmente l’unica concessione alla modernità di un Sindaco che si e’ dimostrato nei giorni seguenti inaccessibile, e che ancora non risponde alle mie telefonate. La ragione di tale comportamento un mistero che sono sicuro si risolverà da solo prima o poi. Avevamo persino acconsentito nei giorni che si sono susseguiti ad inviare una richiesta formale, formulata come concordato tra i vari frenetici negoziatori, e a pagare dal nostro piccolo budget noi i posti necessari per ospitare gli artisti. Senza alcun risultato che un formale diniego in tre righe. Forse la vicinanza delle elezioni (sia quella politica nazionale che quella locale prevista per maggio) ha portato, controvoglia, a esser vittima di una lotta di potere locale.